This seems to be the best instant health potion in WoD. At current patch 6.0.3 and at level 100, the potion restore 70,244 health and 17,000 mana. It doesn't have a range restore like tooltip in wowhead. Doesn't share a cooldown with Healing Tonic or Healthstone, making Alchemy actually somewhat useful in combat, especially for tanks. I may have dreamt this but didn't the recipe mysteriously change from requiring the crescent fish oil to currently requiring healing tonic (from sea scorpion) and mana potion? As a fury warrior with limited self-heals, I literally LIVE on this stuff! Unlike other recipes which often yield a quantity on par with the sum of it's ingredients, the yield is only a single potion at the cost of two others. However with this change, the Дренорское зелье омоложения no longer requires alchemy skill to consume as it did prior to the material update. Maybe this is obvious, but if you're trying to maximize your instant mana restore while in combat, Дренорское зелье омоложения (~16k mana restore) is not the best option. Дренорское зелье маны (~32k mana restore) is better as it restores twice the amount of mana. Дренорское зелье маны does not share a cooldown with Лечебное снадобье and can be used back-to-back while in combat. Дренорское зелье маны shares a cooldown with Дренорское зелье омоложения so they cannot be used while in combat during the same fight. If you want to maximize your instant mana restore while in combat but still want some instant health restore, pop Дренорское зелье маны (~32k mana restore) followed immediately by Лечебное снадобье (~68k health restore) rather than using a single Дренорское зелье омоложения (~16k mana and ~68k health restore). If you're not concerned with maximizing mana restore and are instead looking to maximize health restore while in combat, pop a Дренорское зелье омоложения followed by a Лечебное снадобье to restore ~136k health and ~16k mana. It shares a cooldown with dps pots and mana pots but does not share cd with healing tonics/healthstones. Suddenly it says "Requires Alchemy (500)". Few days ago it did not have this requirement. 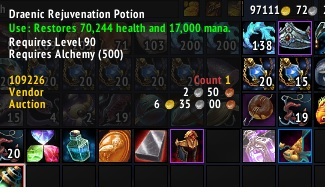 Because this shares cooldown with dps potions and both draenic mana, and draenic channeled mana potions, it remains to be seen in PvE at least when this potion would be useful. A situation where this may be useful could be a fight in which a combination of this potion + healing tonic would be needed to instantly heal the raid for around 140k, think of it as a 2nd Revival, except it also restores a minuscule amount of mana. If there's ever a more powerful version of Infest from Lich King for example, it may be worth sacrificing dps pots for the whole raid to use these pots instead of healers needing to use multiple healing CDs. Basically, this potion in it's current state won't see use unless there comes a fight with an unheard of amount of healing required in an unheard of short amount of time. Personally I might consider buffing it to restore slightly more mana, perhaps 23-25k, as to make it more attractive for healers in a life/death situation. Этот предмет может быть выловлен в Зашедшая Луна (6) и Ледяные скалы (6).